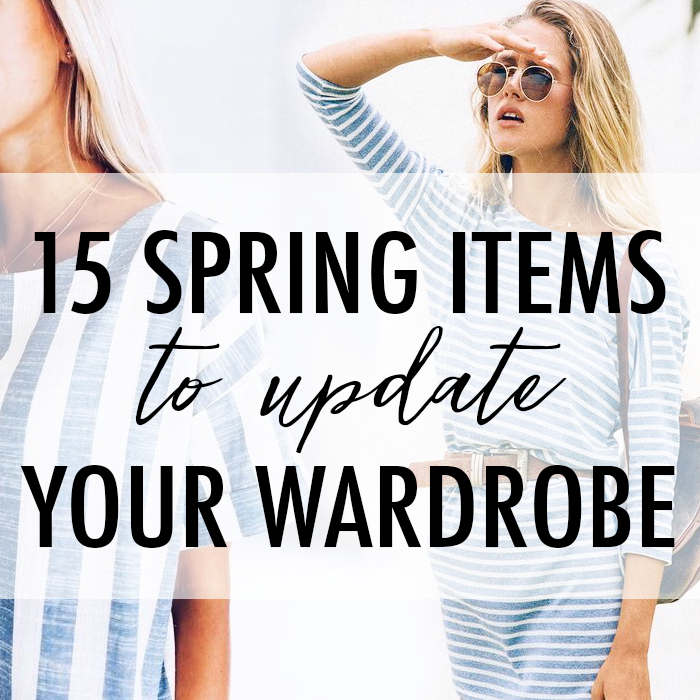 I am sharing 15 spring items to update your wardrobe. Some of them are favorites of mine - like this cardigan that is 40% off! And, if you like blue and white stripes - I found the cutest dress (which could also be a fun beach cover-up). And, I bought this blue and white striped shirt this week. I love pin striped blazers like this one! This is an update to my favorite cardigan - and it's 40% off. This is a cool and classic striped dress that comes in two colors and is only $48. This striped ruffle wrap dress. A cute swing tank for under $30 - comes in four colors. This satin bell sleeve blouse - in 7 colors - and 60% off. I love this statement necklace - great for dressing up a simple look. These suede loafers with a gold buckle are only $25. This new arrival chenille sweater is only $20. These trendy peep toe booties are under 40% off and under $60. This lightweight sweater - is the perfect mix between a tee and sweater. This dress just feels like a party! These mustard colored jeans are only $20. This white belted blazer is only $50 - and could be worn so many ways. This cute handbag is only $50 - and looks more expensive. This blue and white tie front top that is only $18. One of my favorite cardigans - perfect layering piece. This $30 chambray shirt dress. This bell sleeve blouse for under $20. All black look... Those pink mules are only $18 - shop HERE. All white look... how cute are those striped mules that are under $40 - shop HERE. grrr.you always make me spend more money...hehe. Happy Friday! Oh so many good things!!! Love it! Love that ON striped boho dress you got! Great finds and have a great weekend!